The House of the Seasons is now booking tours of its new greenhouse and garden area! Jefferson, TX (April 8, 2015) Construction crews battled rain, sleet, snow, and frigid temperatures all winter long, but spring has officially sprung at the House of the Seasons in Jefferson with completion of a major portion of an outdoor expansion project. 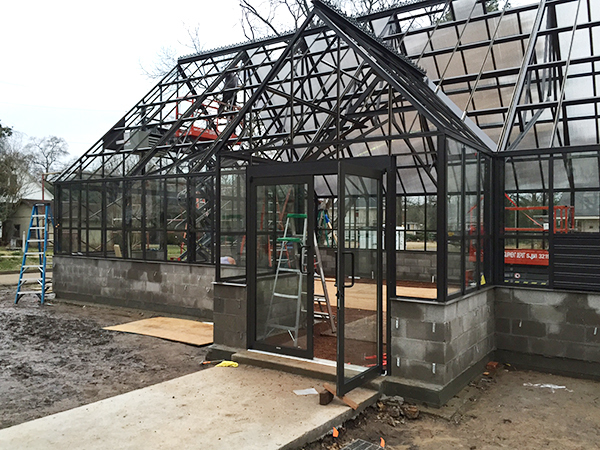 Plants native to East Texas are now growing inside a new greenhouse that was just built on the historic House of the Seasons grounds. 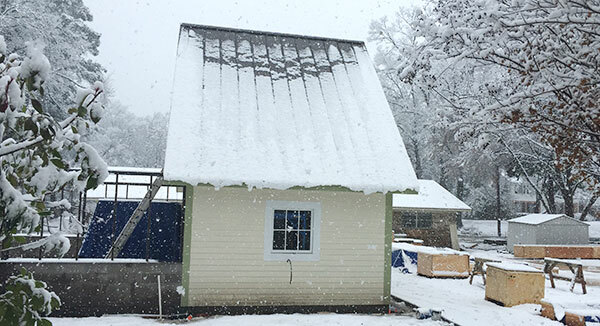 Materials for the custom structure were shipped from British Columbia, then built on site during Jefferson’s harsh winter, said House of the Seasons Vice President and General Manager Shirley Reiman. 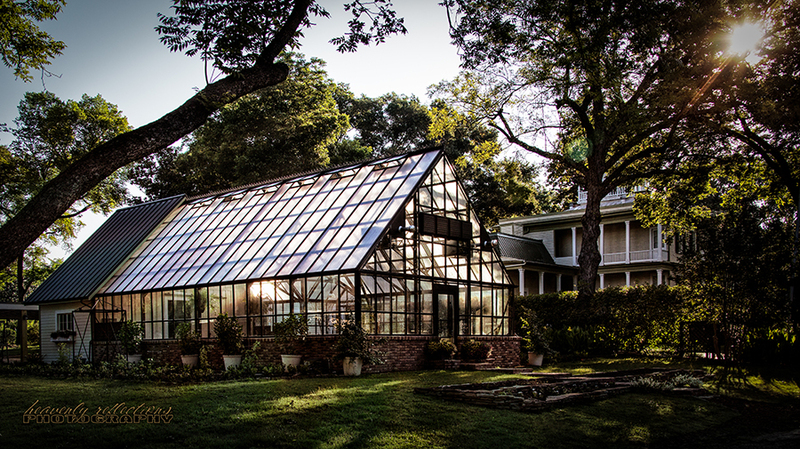 The glass greenhouse is attached to a “head house”, or potting shed, built from reclaimed wood and designed to mimic the House of the Seasons main home. Some of the lumber used in construction was salvaged from an old fence on House of the Seasons property. Inside the head house is a claw-foot tub garden workers will use to mix potting soil. That tub and other antique pieces were salvaged from other historic homes in Jefferson. The greenhouse is being used to grow a combination of seasonal, native and endangered species, which will eventually be planted on the House of the Seasons property and at the Port Jefferson History and Nature Park. Of particular importance is the Neches River rose which is nearing extinction, said Gary Endsley, director of the Collins Academy in Jefferson. The greenhouse was also built to provide horticultural education to students and adults. “This will be a community-based and school-based learning center,” Endsley said. The greenhouse is a high-tech, fully-irrigated facility to ensure a proper growing environment for plants. “We have two heaters and four fans and the temperature will remain controlled,” said Reiman. She explained the House of the Seasons went to great lengths to ensure proper air circulation within the greenhouse, because that encourages plants to develop a stronger root system. The greenhouse is only the tip of the iceberg of the House of the Season’s outdoor expansion. A field of dogwood trees, a vegetable garden, and new parking area are also planned. To accommodate all of this growth, the House of the Seasons acquired the Bonner property at the corner of Friou and Delta Streets. The 1960’s era home on that property will become a new office, storage, and service facility for the House of the Seasons. The design of that building will mimic an 1870’s era stable. The House of the Seasons is a historical museum home in Jefferson, Texas that offers bed and breakfast accommodations in its carriage house. The original owner was Colonel Benjamin H. Epperson, a Texas lawyer, political leader, entrepreneur and confidante of Sam Houston. He built the home in 1872. Richard H. Collins acquired the home in 1973 and spent three years restoring it. It is now owned by the Collins Family Foundation. Guests have included: Former President George W. Bush and First Lady Laura Bush, Former First Lady Lady Bird Johnson, Lawrence Rockefeller, NFL Hall of Fame Quarterback and congressman Jack Kemp, former Bush advisor Karl Rove, Senator Kay Bailey Hutchison, Congressmen Ralph Hall, Jim Chapman, Sam Johnson, Louie Gohmert, Texas Education Commissioner Michael Williams, Texas State Representative Chris Paddie, movie star Karl Malden, and authors Pat Conroy, Fannie Flagg, Melanie Benjamin, and Leila Meacham. Visit houseoftheseasons.com for more information. Email or call 903-665-8000 to reserve space for events such as weddings, receptions, and holiday gatherings.